The High Plains aquifer underlies 111.8 million acres (about 175,000 square miles) in parts of eight States—Colorado, Kansas, Nebraska, New Mexico, Oklahoma, South Dakota, Texas, and Wyoming. Water-level declines began in parts of the High Plains aquifer soon after the beginning of substantial irrigation with groundwater in the aquifer area (about 1950). This report presents water-level changes in the High Plains aquifer from predevelopment (generally before 1950) to 2013 and from 2011 to 2013. 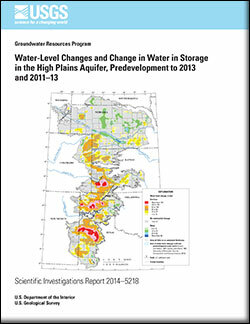 The report also presents change in water in storage in the High Plains aquifer from predevelopment to 2013 and from 2011 to 2013. The methods to calculate area-weighted, average water-level changes; change in water in storage; and total water in storage for this report used geospatial data layers organized as rasters with a cell size of 500 meters by 500 meters, which is an area of about 62 acres. These methods were used to provide a raster dataset of water-level changes for other uses. Water-level changes from predevelopment to 2013, by well, ranged from a rise of 85 feet to a decline of 256 feet. Water-level changes from 2011 to 2013, by well, ranged from a rise of 19 feet to a decline of 44 feet. The area-weighted, average water-level changes in the aquifer were an overall decline of 15.4 feet from predevelopment to 2013, and a decline of 2.1 feet from 2011 to 2013. Total water in storage in the aquifer in 2013 was about 2.92 billion acre-feet, which was a decline of about 266.7 million acre-feet since predevelopment and a decline of 36.0 million acre-feet from 2011 to 2013. McGuire, V.L., 2014, Water-level changes and change in water in storage in the High Plains aquifer, predevelopment to 2013 and 2011–13: U.S. Geological Survey Scientific Investigations Report 2014–5218, 14 p., http://dx.doi.org/10.3133/sir20145218.